A Linux and Windows GUI to enable the rapid selection and subsequent hashing of files, either individually or recursively throughout a folder structure, text and (on Linux) disks. Last edited by I am Baas on Thu Apr 23, 2015 5:58 am, edited 1 time in total. I am Baas wrote: A Linux and Windows GUI to enable the rapid selection and subsequent hashing of files, either individually or recursively throughout a folder structure, text and (on Linux) disks. Another good hasher. Very good news. Doesn't resize very well and requires almost the full scale of a 1024x768 monitor. Not a big issue, but think the dev was trying to get everything on one screen. Quick Hash - has a component someone was asking about a long time ago: the ability to hash files WHILE copying them. It's a useful function and makes sense that while your computer is reading a file to copy it, it could be hashing them at the same time with very little CPU overhead. Doesn't seem to have a hash verification function, which is odd. - Added a 'Copy to Clipboard' button (it is still possible to to copy a cell or range of cells by selecting and Ctrl+C them). Complete support for Unicode on Windows, ensuring filenames or directotries containing Chinese or Arabic or Hebrew (etc) characters can now be processed using QuickHash without the user having to change their language and region settings. Prior to this, QuickHash was generating the default initialisation hashes for such files but not actually hashing them. All users are encouraged to discard any version prior to v2.2 and adopt v2.3. It was reported that large files failed to hash properly with SHA256 or SHA512 implementation. It turned out this was due to a 32-bit integer delcaration in the DCPCrypt library that is used by QuickHash for those two algorithms. Updated by using QWord instead Longword variables. Output checked against SHA256SUM and SHA512SUM and found to be OK now. Linux version brought to same level as Windows version. Interface improved to better display values. All versions prior to 2.1 suffered a 32-bit 4Gb limitation when copying (as part of the 'Hash, Copy, Hash' routine) a single file larger than 4Gb. That was fixed by casting the "filesize" variable to Int64 instead of Int32 meaning the size limitation is now set by your filesystem only (16 Exabytes for NTFS). International language support added for filenames and directories that contain or might be created of a non-English nature by use of UTF8 casting. For example, the destination directory for "Hash, Copy, Hash" can now contain non-English characters. sha-1, for example, is always da39a3ee5e6b4b0d3255bfef95601890afd80709. To avoid confusion, if a file is zero bytes, it is not hashed at all and the entry 'Not computed, zero byte file' is enetered into the results. Though I acknowledge some users may feel it is necessary to hash zero byte files for security reasons, on the whole, I don't think it is for 99% of users. Files of zero bytes are now copied as part of the "Hash, Copy, Hash" routine to facilitate those who wish to use QuickHash as a backup system where, on occasion, zero byte files are created by software and are required in order to function properly. Date format of output directory changed again to 'yy-mm-dd_hhmmss' (e.g. QH_13-12-25_221530) due to the now widespread use of QuickHash internationally. The previous format of ddmmyy worked OK for UK users, but there is some merit in the year, month, day format, especially for multiple output dirs. Interface entirely re-written to use tabbed design with each hashing feature having it's own parent tab. Allowing the util to be used on low resolution screens. Default size is now ~900 x ~1000 pixels meaning it should be visible on every screen but the smallest of resolutions. This work has made the exe leaner with less decision loops and less code. Status bars more neatly attributed to each individual process to ensure they are kept in place during resizing. All necessary fields (source directory path fields, grid displays, text areas etc) that a user may want to make wider when the GUI is maximised are now all right aligned meaning they'll grow when the GUI is maximised. Note, though, that the v2 interface is designed to be now 850 pixels wide. Date format displayed as dd/mm/yy hh/mm/ss instead of dd/m/yy hh/mm/ss for ease of reading the systems date and time settings (that are reported to the user for some functions) that QuickHash is running on and to ensure the output directory is easier to read. The destination dir for copy and hash processes now read "QH_ddmmyy-hhmmss". Moved some of the tick boxes into a panel group to help with resizing and moved the status bars of recursive directory hashing further in to the left. The display grids for displaying hashes of multiple files in a directory and for "copy and paste" hashing now have the number of rows pre-computed based on the number of files found prior to hashing. This saves a considerable amount of time with large data sets. Combined with the step above, a gigantic speed improvement caused by also disabling the dynamic bottom pane until after all files are hashed. Having it refresh for every file was not really necessary anyway, given that the status bar reports the file being hashed and the progress stats show files %, data volume etc. enchmarks show 3K files took 2 minutes with version < v1.5.6; With v1.5.6, the same 3K files take 12 seconds! The same visiblity change applied to recursive copy and hash, though, in tests, the process of copying the files was slower than the grid display but with lots of small files, this is likely ot have made an improvement. With regard to recursive directory hashing and recrusive copy and hashing; the user can now decide to override the default behaviour of hashing all files in all sub-directories of that chosen directory, meaning that just the files in the root of that chosen directory can be hashed (and copied if appropriate) and no others in other sub directories, if required. The user can now decide whether to flag any duplicate files found, or not (only for standard direcotry hashing - not for copy and hash, yet). The left to right scroll bar of the bottom pane was partly obscured by the status bar. That was corrected. Added file mask capability to allow selective searching for one or more mixed file types, e.g. *.doc; *.xls etc. New masks can be added at will. Added progress indicators to recursive copy and hash, to match the standard recrusive hash without copy. A new intermidiary output directory, named after the date and time of execution, is now added beneath the output directory with the output then put beneath that ensuring that if multiple outputs are sent to the same directory at different times, each output can easily be identified. of "Copy to RAM" was misleading, suggesting the files would be copied to RAM, which was not true. Improved layout slightly by replacing some labels with edit fields. Improved the 'Hash mismatch' error to make it easier to read and including the name of the actual file that has failed, as well as just the hash value. Text Hashing - Turn off the reset function - I kind of wish the text wouldn't disappear after you click "Generate Hash" and then click back into the entry window. Help file - like what the heck is Disk Hashing? Option to save a CRC checksum into the file name (like RapidCRC) ... would love to do this for copying file on drive backups. This is good if you want to run a backup and show that you really transferred those files and that it went over correctly. Again, I'm wishing there was a batch method to come back and verify the files haven't changed down the line (to check for data corruption or other modifications). Quick Hash GUI V2.5.2 is available. Last edited by I am Baas on Fri May 13, 2016 11:52 pm, edited 1 time in total. Added a Save to Files button in the same tab to allow the content of grids A and B to be saved as two seperate CSV files (one for each grid) and a single combined HTML file (with the content of table A displayed in one table, the content of table B displayed in the other). Fixed the truncation of Total Files in DirA and Total Files in DirB in Compare Directories tab, where counts more than 99 (i.e. 100+) were being truncated. So 150 files was being written as 15. Note this only affected the user display  not the log or display grid. Ensured that if the user re-runs a comparison of two directories using the Compare Directories tab, any values from the previous comparisons are cleared, such as the values in the display grids, the time ended, the hash match status, etc. Prior to 2.6.1, once a scan had been conducted, the display was not updated until the second scan had finished, as opposed to clearing it at the start of the subsequent scan. Added a clickable link to the QuickHash projects homepage at sourceforge. Fixed column mis-alignment for HTML output of the FileS tab; the mis-alignment was caused by the seperation of file name and file path into two different columns in v2.5.2. where the seperation in the grid was not carried forward to the HTML output. Added the ability to delete duplicate files where found, if the user chooses to detect duplicate files only. Further hints corrected in 'Copy' tab. Further features to try and help users who have a small screen or have set a very low screen resolution. QuickHash will now detect the users screen settings, and, if they are smaller than the default size of QuickHash, QuickHash will be scaled down at the top and the left to that resolution high and wide, less 50 pixels, to be on the safe side. That will, at least, enable such users to get some, if not all, of the functionality from QuickHash and enable them to move it around the screen etc. Wher as before, QuickHash would load bigger than the users screen (if they used a small resolution) preventing therm from being able to drag it and resize it. Added the ability to move data to very long folders where the total length of the reconstructed folder might exceeded the maximum allowed length of a folder (as dictated by Microsoft Windows, not NTFS) of 260 characters. Not that it only allows the copying of files TO a folder with a length > 260. If the source folder is itself longer than that, the files in those longer folders will not be found yet (will add the ability to do so in later versions). Several hints on various buttons and labels corrected to show informative instruction. The file type mask told users to separate extensions with a space, when no space is needed. In fact, adding a space might case file types not to be found. The Disks tab was made accessible in the Linux version, but the button disabled and a descriptor to users to just use the File tab instead, because users were confused thinking they could use the tab on the Linux platform but they were unsure why it was greyed out. When hashing individual files in the File tab, if the user single clicked a file, but then clicked 'Cancel', the file was still being passed to the hashing procedures. That was fixed so that if the user cancels, the file is not hashed. NEW: Replaced two buttons with two treeview panes in the 'Copy' tab. Left pane is for the user to choose where to copy files FROM. Right pane is for the user to choose where to copy files TO. On appropriate selection, the user needs just press 'Go' and on completion a new form shows the results. FIX: In the 'Compare Directories' tab, the save button will now also save the hash comparison result to the log file, i.e. did the comparison match or not? And how many files were counted in grids A and B (feature request #20 http://sourceforge.net/p/quickhash/feature-requests/20/). FIX: In the 'Compare Directories' tab, the file counts of the grids and difference counts were overlapping with the labels when high file counts were examined (tens of thousands upwards). Fixed by anchoring the elements. The exclusion of files that were zero bytes (functionality that was introduced in v2.1 back in 2013) meant that block devices in Linux, like /dev/sda or /dev/sda1, were simply ignored if selected by the user and not hashed. A new compiler directive added to ensure that if the file is reported as zero byte that a secondary check is then done to see if its a block device in Linux. If so, it will be hashed providing QuickHash is ran as root or sudo. As per feature request #15, and in part request #7, added an 'Expected Hash Value' field to Text and File tabs to enable the user to paste an already computed hash value (perhaps from another tool, e-mail, webpage) into QuickHash. If the field contains anything other than three dots, once the data hash is generated in QuickHash, it will compare it against the expected hash in this field and report match or mis-match. Corrected the fact that that the values for Total Files in Dir A and Dir B in the comparison of two directories, were the wrong way round. Minor GUI improvements like anchoring. Bug #16 (https://sourceforge.net/p/quickhash/tickets/16/) highlighted an issues with the “Don't rebuild path' option of the “Copy” tab wherein the copy failed. This was tracked back to v2.6.3 when the new treeview feature was added, replacing the former button path selection functionality. The bug was caused as a result to a path parameter that no longer existed. That was fixed. QuickHash can now READ and WRITE from and to folders that exceed the MAX_PATH limit of MS Windows, which is 260 characters. A limit of 32K is now adhered to with QuickHash 2.6.4, meaning files may be found on filesystems that were put there by software that is able to bypass the MAX_PATH limit even if regular software like Windows Explorer is unaware of their existence. “UNC Mode” added to the “Copy” tab, specifically to enable the user to operate in pure UNC mode but with the new 32K path length limits. Useful for comparing data on multiple network nodes that may not be mapped as a drive letter. Windows only feature (not needed for Linux and Apple Mac). The tree view in the copy tab are now sorted alphabetically. The “Choose file types” option that has existed in the “Copy” tab for a while has now been added to the “Files” tab by user request. Meaning the user can now recursively hash a folder and sub-folder of files but choose which files to include and which to include. Extension basis only and not file type signature analysis. Further GUI anchoring improvements, to make the program display elements better when maximised, with less overlapping hopefully. Some historic error messages updated and improved, and made more OS specific. V2.6.5 At user request, the "Text" tab now allows line-by-line hashing of each line. The results are saved to a comma separated text file that can be opened in a text file editor or spreadsheet software. For example, Google Adwords requires SHA256 lowercase hashes of customer e-mail addresses. So with QuickHash, you can easily paste your list of addresses into the text field, click the "Hash Line-By-Line" button and the output is saved as CSV output for you, ready for use with Google Adwords or any similar product line (https://support.google.com/adwords/answ ... 5?hl=en-GB). Tested with data sets of the low tens of thousands. Would be interested to hear how it copes with larger volumes of data. 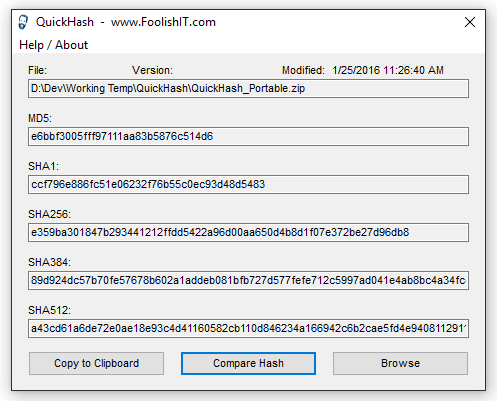 http://www.foolishit.com/free-tech-tools/quickhash/ wrote: QuickHash is a utility to quickly display the MD5, SHA1, SHA256, SHA384, and SHA512 hashes of any selected file, and optionally compare the hashes with any hash string. Useful for verifying file downloads (less than 2GB). V2.6.6 - Jan 2016 Added the ability to hash the content of a text file line-by-line (an expansion of the ability to hash pasted text line by line). This means the user can select a file full of a list of names or e-mails addresses or whatever, and each line will be hashed seperately. Carriage return line feeds and nulled space should be trimmed from the end of each line. Added a RAM status field (Windows only) that updates itself every few seconds with the RAM status of the computer. Useful if particular large data sets are being dealt with. Ever since 2011, Quickhash has only been shipped as a 32-bit version for Windows, in the knowledge that all the internal 64-bit requirements are dealt with and the fact that QH doesn't need the extra RAM and so on provided by 64-bit systems. However, a bug was reported (#17 - http://sourceforge.net/p/quickhash/tickets/17/) that highlighted an issue with 32-bit versions of QH running on 64-bit Windows with regard to the content of the Windows\System32 folder. The files in here are presented differently to 32-bit programs than 64-bit ones using the SysWoW64 system. "The operating system uses the %SystemRoot%\system32 directory for its 64-bit library and executable files. This is done for backward compatibility reasons, as many legacy applications are hardcoded to use that path. When executing 32-bit applications (like Quickhash, which doesn't need to be 64-bit), WoW64 transparently redirects 32-bit DLLs to %SystemRoot%\SysWoW64, which contains 32-bit libraries and executables. 32-bit applications are generally not aware that they are running on a 64-bit operating system. 32-bit applications can access %SystemRoot%\System32 through the pseudo directory %SystemRoot%\sysnative." https://en.wikipedia.org/wiki/WoW64 This means, essentially, that the 32-bit mode of QH, when run on 64-bit systems, is presented with different data to what it is expecting by the filename natively. The users affected by this are minimal (perhaps none except the user who reported it) because it only impacts upon files in that specific folder. Other folders are not affected. Nevertheless, to resolve this, as of v2.6.6, a dedicated 32-bit and 64-bit executable are now provided for Windows. Users are encouraged to use the appropriate executable for their system, but in 99% of cases the 32-bit one should work fine in 32-bit emulated mode, unless the content of C:\Windows\System32 is to be examined. In short- from version 2.6.6 on Quick Hash will be released in two editions- x32 and x64.